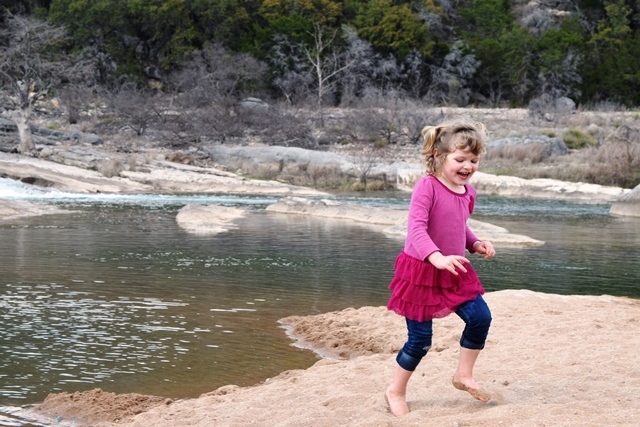 Whit's Wilderness | Review: Pedernales Falls, Y’all! We women have standards! Ever since then, I have been curious about the restrooms at that park. Last month while camping there, I found out that indeed his wife was right, the restrooms at Pedernales Falls sparkle. I never once thought, “Ew…gross, ” and that is nothing short of a miracle. One tip on this – the restroom at the main gate is usually busy and is not the best restroom. 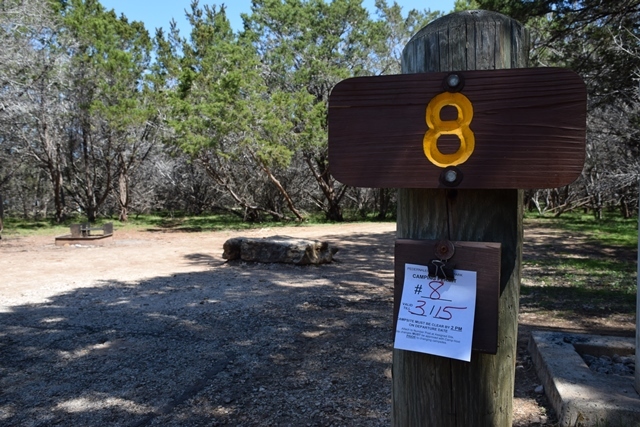 Instead, use the restrooms at the campsites, which are marked on the map. Only about 3 minutes from HQ. 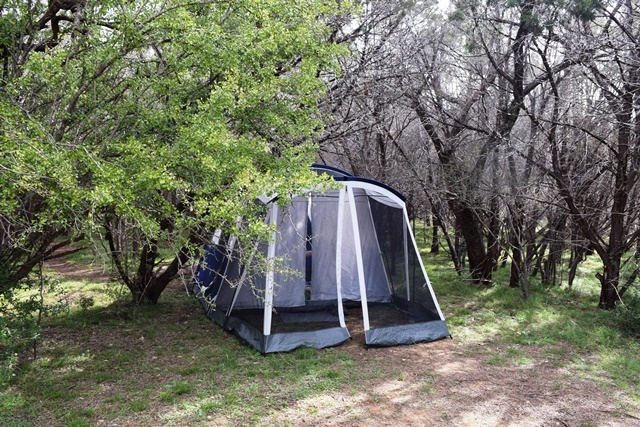 I loved the campsite setup at Pedernales Falls. Each one is secluded, tucked into groves of juniper and connected by charming trails winding through the woods. We had privacy, but at the same time were comforted to know that restroom amenities and the park ranger’s cabin were within a hundred yards. This was the view from our tent. Rain wasn’t in the forecast so we left the rain fly off. 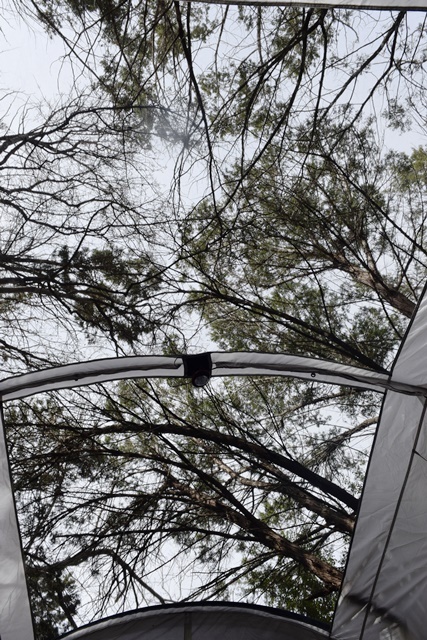 Looking up through the clear roof of our tent made my trip complete. 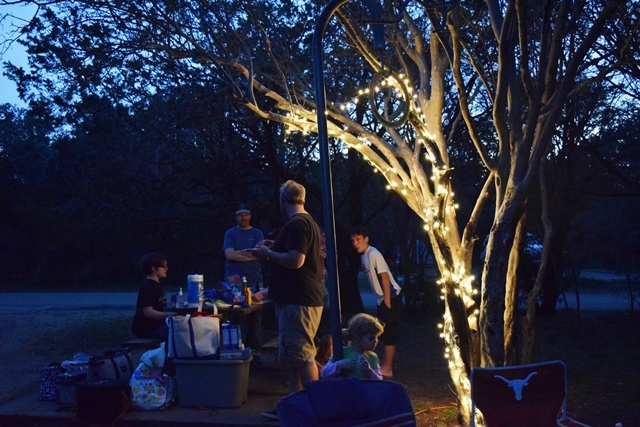 Perhaps most importantly, Pedernales Falls has running water and electricity at each campsite. You don’t have to completely forego modern conveniences to enjoy the outdoors here. I plugged in string lights, my phone, and a coffee maker, and I felt like my normal self. PS. Don’t forget to pack an extension cord. A park is always fun if it has a cool waterfall or other unique natural feature to ooh and ahh at. 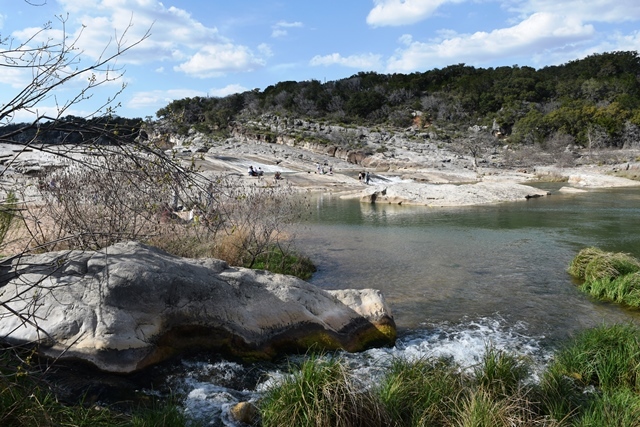 Pedernales Falls takes the cake in this department. Behold, 8 square miles of rock waterfall to climb around on and explore. There’s also a sandy beach, which is a huge hit with kids and corgis alike. Trooper loves running in the sand. Along these falls, there are boulders bigger than your car, cavernous limestone formations, and springs sprouting out of the rock. And if the falls aren’t enough to tickle your fancy, there is also an additional set of waterfalls, Twin Falls, a gorgeous tiered waterfall in a different part of the park that looks like something out of a magazine. My pictures don’t do it justice, you’ll just have to see it in person! 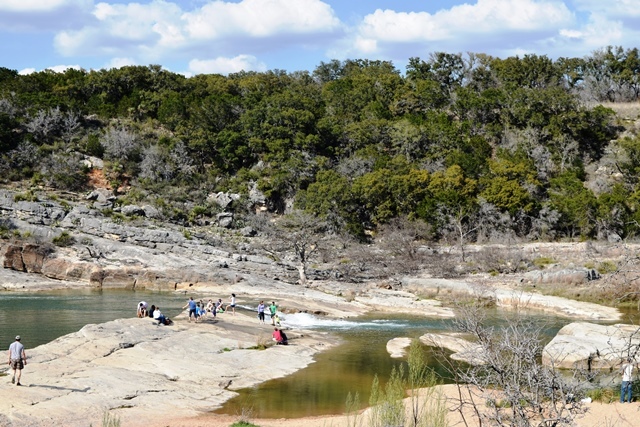 Only an hour from Austin, Pedernales falls is doable in a weekend or day trip. I hope you get to check it out. You will not be disappointed! PS. Check out Google images of the flash floods before you go. Pretty incredible. 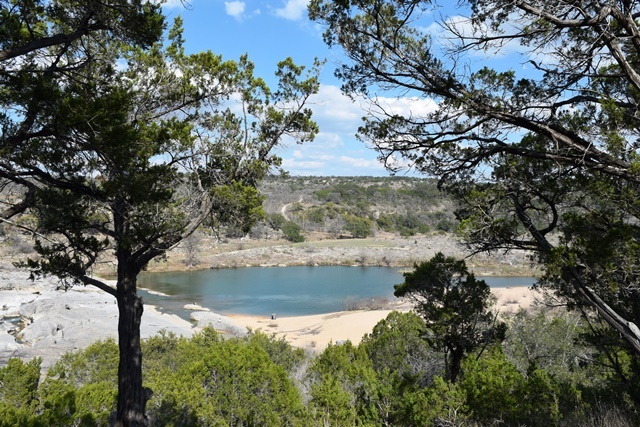 2 Replies to "Review: Pedernales Falls, Y'all!" 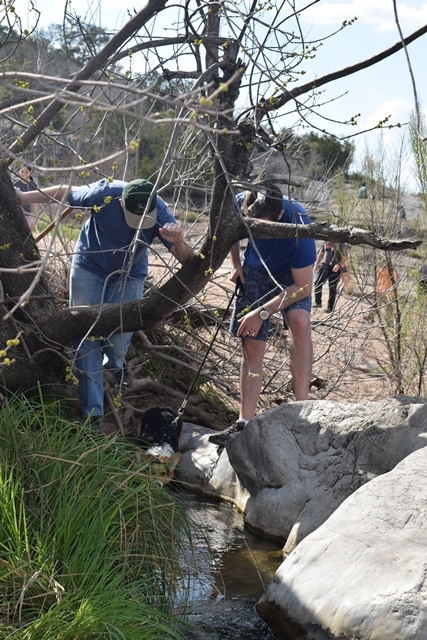 We visited Perdanales Falls on our spring break glamping trip this year! I wish we could have spent more time there. We went down stream and swam in the rapids. It was so much fun. I’ve seen the flash food videos and the water that moves through that area is incredible! Yes it is crazy during a flood. That’s why they call this part of Texas “flash flood alley”. I’m glad you got to see it! It’s one of my favorite parks!